This is the perfect Xmas gift for a small child, it will fit in a stocking perfectly. And it’s Elmo! Who doesn’t love Elmo! Elmo loves Elmo! This cute set of fork and spoon is made of plastic that is BPA Free, Phthalate Free, Latex Free and Nitrosamine Free. They say it’s top shelf dishwasher safe but I would hand wash just to be certain. The crevasses in Elmo could leave trace amounts of food or dishwasher detergent and that isn’t good for our little friends. This children’s flatware is designed for self-feeding and the rounded fork and spoon tines are for safe feeding. 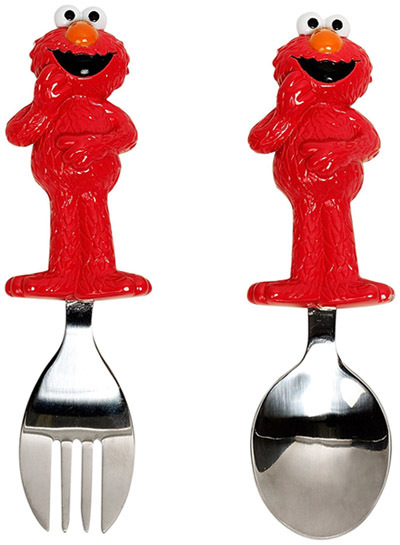 Elmo want to feed himself!